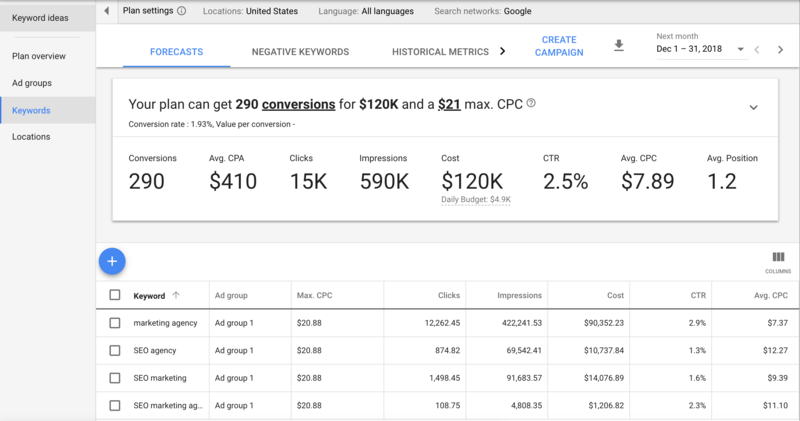 If you’ve used Google AdWords, you’re probably familiar with the Google Keyword Planner. It’s a very powerful tool that you can use even if you don’t want to spend money on an AdWords campaign. You do, however, need to set up an AdWords account. Once your account is set up, sign in and go to ads.google.com. From there, click the Tools icon, then click Keyword Planner in the menu that flies out. 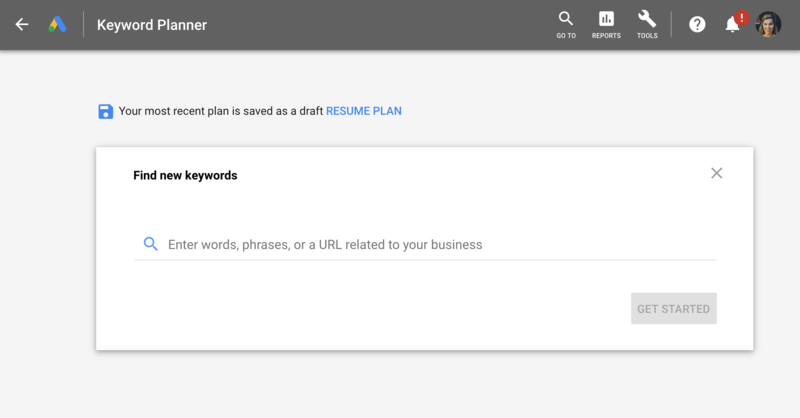 So, now that you’ve got access to Google Keyword Planner, what can you do with it? Once you open the keyword planner, you can enter a variety of options to get new keyword ideas. Google’s instructions say to “Enter words, phrases, or a URL related to your business.” Google will then display a list of keyword suggestions. 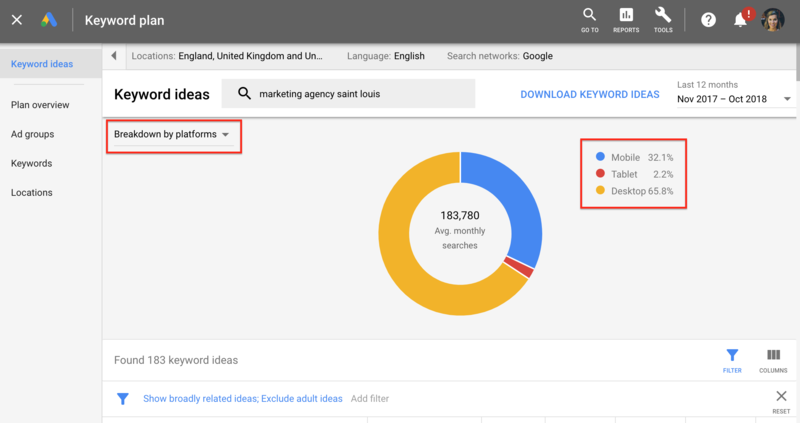 Once you’ve entered your word or phrase, select “Get Ideas.” You’ll be taken to the Keyword Results page, which is where you’ll find potential keywords. Take a look through the list — you might find some new keyword ideas you haven’t tried using yet. Once you have a list of keywords, you can see metrics for them by choosing the Get search volume and forecasts option. Here, you won’t see keyword suggestions. Instead, you’ll see an estimate of how many clicks and impressions you could expect if you ran an ad for 30 days using those keywords. You can also see estimated costs, CTR, and CPC information. Pro tip: Go to the Historical Metrics tab and change the date ranges for even more insights. Although it’s designed for use with AdWords, Google Keyword Planner has many other helpful uses. Here are the top seven ways to use Google’s Keyword Planner that you haven’t thought of. Knowing more about what’s being searched for — and where — can help you create the most effective ads on other platforms, including Facebook. 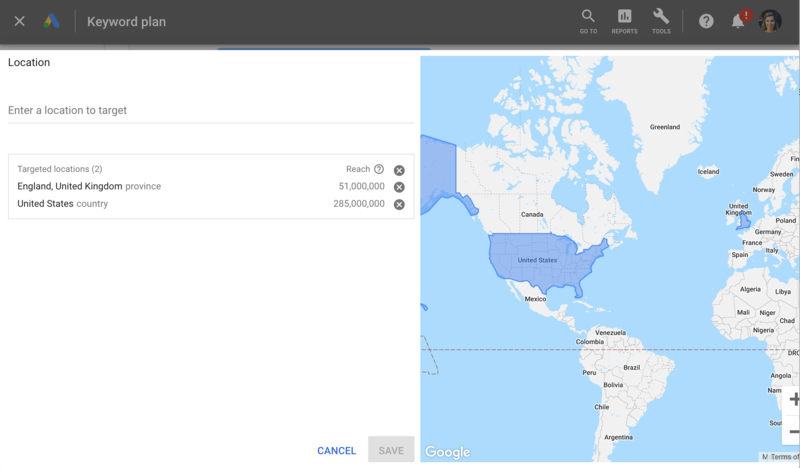 Use location filters to look at the reach for a product or service you want to promote. You can find out where certain types of ads perform better than others. Then, you can focus your ads on the locations most likely to generate more customers. 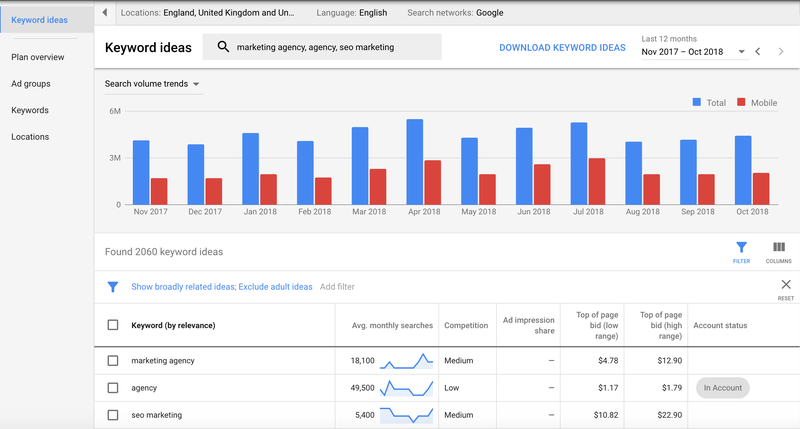 Keyword Planner data can also be used to learn more about how interest in certain products evolves from month to month. For example, you’re more likely to see searches for sunglasses from February to July — or searches for Halloween costumes from August to October. The keyword tool might also uncover that searches for particular products are relatively consistent throughout the year. Armed with this information, digital marketers can adjust their plans to better target the right people at the right time. Most of the time, Google Keyword Planner is used to research keywords related to certain search terms. You can also repurpose it to search for terms related to certain websites. Instead of using a search term, start with a URL and search the entire site. From here, you’ll be able to see the keywords related to your competitor’s site. This can help you identify which keywords are the most (and least) successful for you and your competition. Keyword Planner helps you learn how your audience is searching for your products and services. With these seed keywords, you can develop content such as blog posts that addresses the selling points of your solution. Check out average monthly searches to see how keywords are ranked over time. If there are very few searches for a particular keyword, don’t bother creating content that uses that term. Instead, focus on the terms with the highest rankings. You can export your keywords from the Keyword Planner by clicking the “Download Keyword Ideas” button. By exporting your keyword list, you can cross-reference it with other keyword research to get the best results. You can export the entire list or choose specific keywords to export. The forecasting graph in Google Keyword Planner is great for estimating the optimal CPC for the keywords you want to target. Find the point on the graph where your CPC bids reach diminishing returns and compare that number to your Return on Ad Spend (ROAS). The device estimates should give you an idea of the distribution of clicks your keywords will generate from the various possible devices. These estimates can help you determine which kinds of ads to run. If you get more action on mobile, you’ll want to focus more of your efforts on mobile-friendly advertising and marketing. 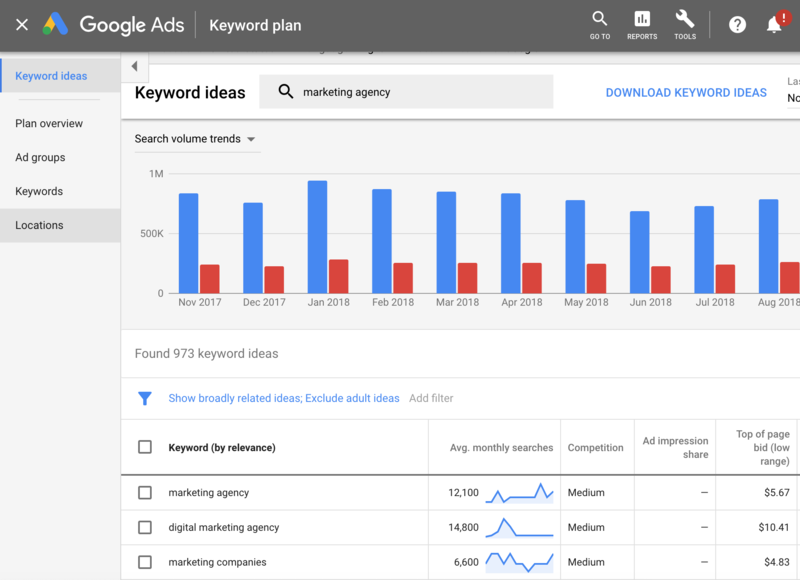 No matter how you use Google Keyword Planner, its benefits can help marketers at organizations of all sizes get the most bang for their buck. Combining these strategies can make it easier to go after the audiences who are most likely to become customers.